I have learned from personal experience that attempting to board a narrow boat boat away from the bank and from a low position with your boots and pockets full of water is a very difficult operation. Having acquired this knowledge we included an additional step in Waiouru’s specifications. There is one either side at the stern. 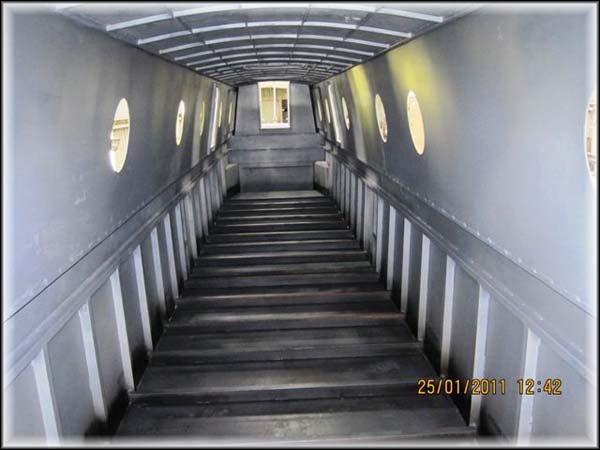 Hopefully no one will even have a need to use these steps to board Waiouru. 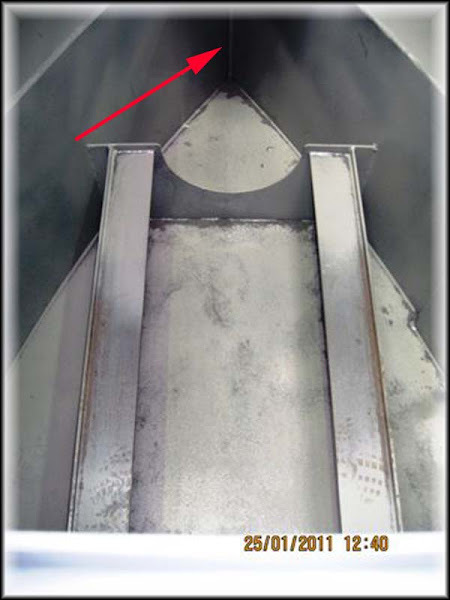 The other interesting thing to note in the photo is the thickness of the base plate which is twice the normal thickness. 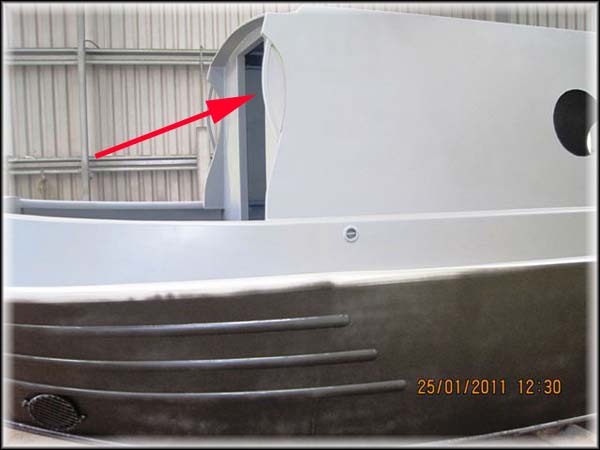 You may have noticed the location of the rear porthole in our previous post. Here is the photo again. 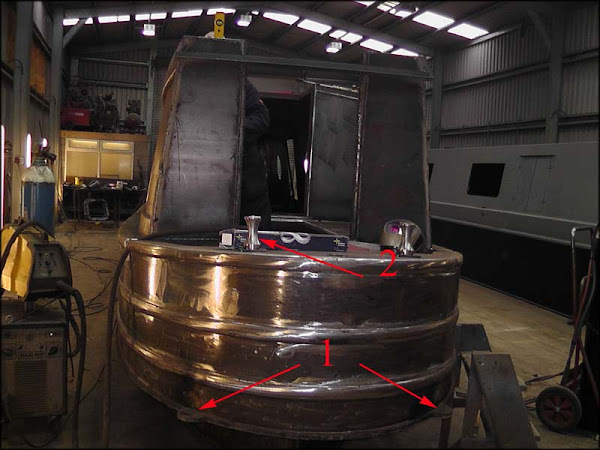 Tim Tyler has managed to fit the porthole in the centre of the smaller of the two recessed panels. 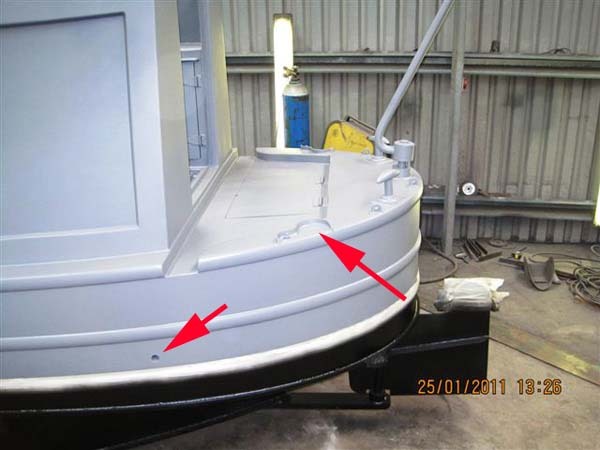 He managed to achieve the same effect on the port side as the following photo shows. I’m really please he managed to do this as it’s something I hadn’t considered when calculating the location of the portholes. My visit yesterday to the British High Commission Visa Section in Canberra went well. I had a business meeting in the airport complex and as the Consular Office was only one kilometre away I took a stroll after the meeting to see if I could obtain answers to my questions. The Consular was almost empty and as a result one of the officers kindly took the time to answer all my queries. At the end of the meeting I told him I actually had all the necessary supporting documents with me and could I actually apply on the day. He regrettably informed me they were closed for the day. I thought it was rather good of him to give me some of his time on a day they were closed. The result is that I will have to make an online application and credit card payment. As part of this process I need to make a booking to have my biometric details collected (photograph and fingerprints collected). Unfortunately this can’t be done in Adelaide which means I shall have to fly interstate to have the information collected. I’ll probably make the booking in Melbourne as I’m likely to find the cheapest airfare on that route. It will just be a one day round trip. With the time zone change it will be another early start to the day. I do have another business meeting in Canberra sometime in the middle of March, however this would not give sufficient time to have the visa application processed. When you look at the inside of the empty shell it looks huge. However once fittings start being installed I can envisage it will rapidly start to shrink in size. We have deliberately attempted to limit the number of internal partitions (there are only three) in an effort to give the impression of “space”. 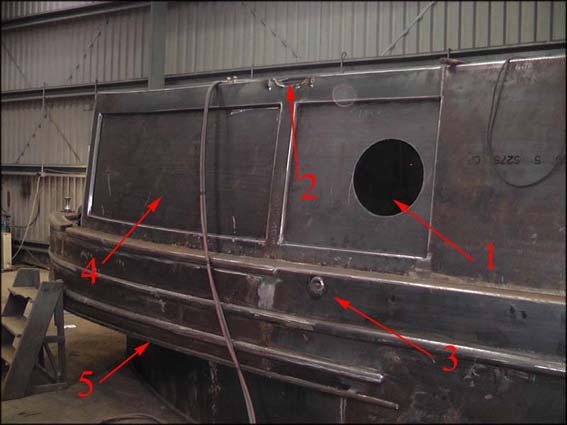 At the far (stern) end of the cabin there is a section that has no floor joists. (not sure if this is the correct nautical term). I’ve tried to magnify this area in the next photo, however the resolution has made it slightly out of focus. The red arrow is pointing to the section. This is where the underfloor blackwater tank will be installed. 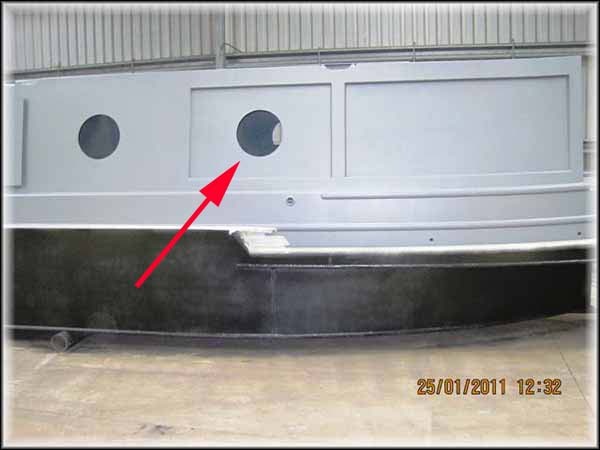 It’s one of the reasons why we specified Waiouru was to have a 20mm thick base plate. 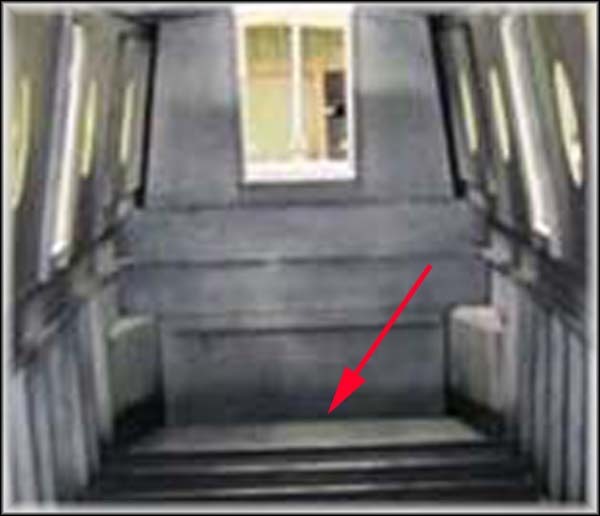 The idea is we will free up more usable space inside the cabin by installing the tank under the floor. There is nothing new in the idea but I didn’t realise that when I first thought of it! I’ve noticed that there appear to be small indentations in the side of Waiouru and am trying to think of their purpose. I can’t zoom in any further. There appears to be two more further towards the stern and this time they are set one above the other. The left arrow is pointing to it. My guess is they might be water draining holes for the cockpit or perhaps vents for the rear gas locker. This would explain the higher hole on the starboard side. Can any of my readers confirm my assumption or tell me their real purpose. 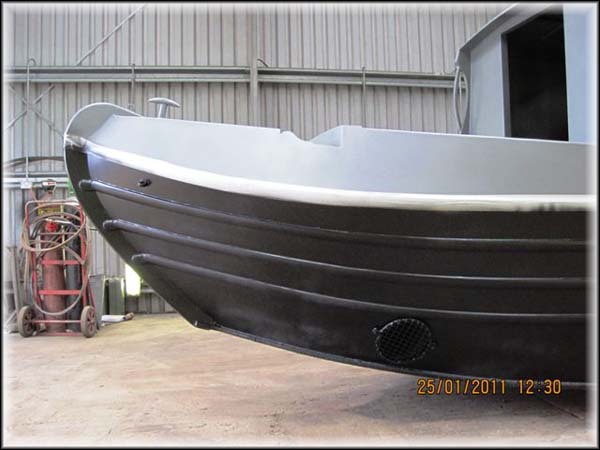 When this photo was taken there was one final (3rd) full coat of two pack epoxy blackening to be applied and a 4th coat 6” wide either side of the waterline. 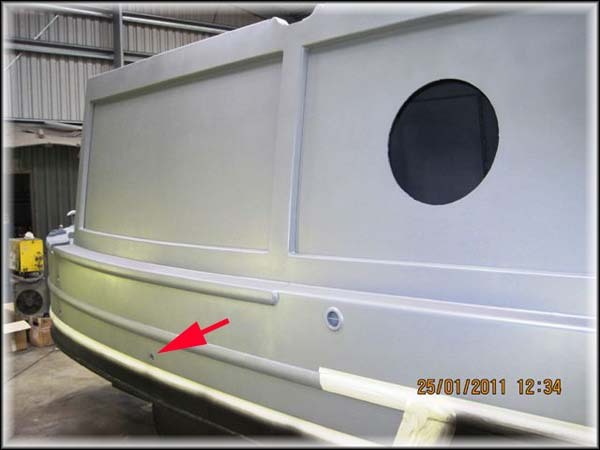 The grab handles at the bow have also been now been fitted. I has been a very long and tiring day so I will post more tomorrow. As part of the boat minimalist plan I’ve turned my attention to reducing the physical size of of the video storage data. My plan is to get everything onto two 2TB hard drives. Please ignore all my sticky fingerprints and dust. The HDium is a rather plain black box with a card reader on the front. Nearly all the input and output sockets are at the rear. It has two internal TV tuner and capture cards which will enable us to watch one channel whilst recording another. 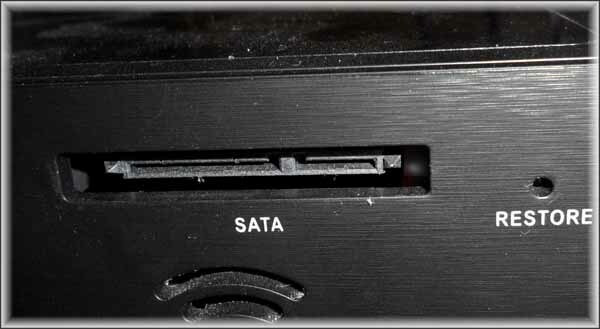 On the right side there is a rather unusual socket for an external Sata II hard drive. 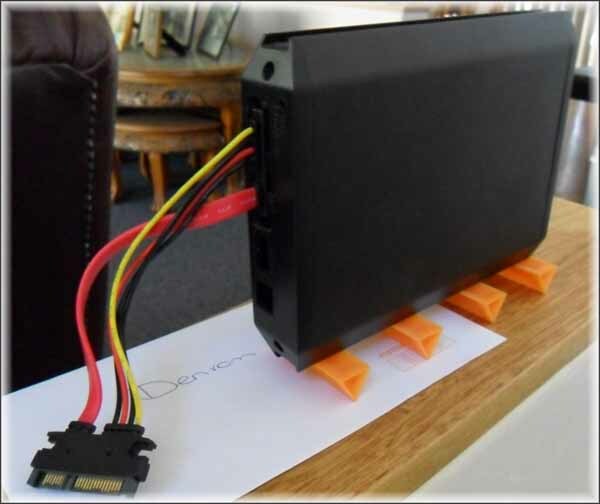 It’s not a real eSata socket but rather a quasi socket for a second internal Sata drive to be connected externally. 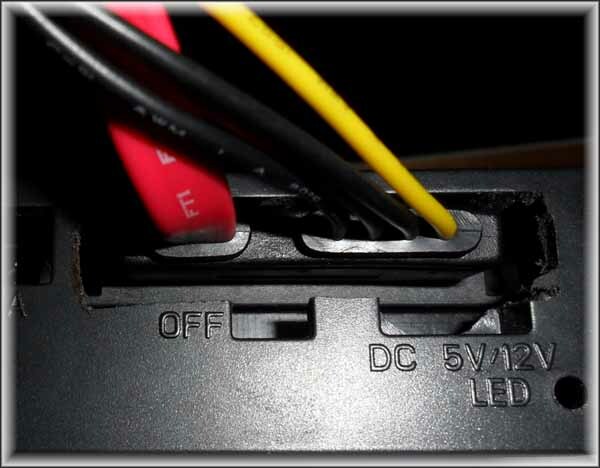 The HDium comes with a special cable to connect the second internal sata drive to the socket. I didn’t want a naked internal drive sitting beside the NMT. My solution has been to modify an old external hard drive case. The power supply for it had failed which enable me to cut a hole in the end of the case. This enable the special cable to connect to the sata drive I’ve installed in the case. I’m now able to connect the external drive to the NMT. This gives us 4TB of video and sound storage capacity. Enough for approximately 8000 TV episodes. I guess this will keep us amused on those miserable days when we don’t want to venture outside! Well it appears I may be able to visit the British High Commission in Canberra earlier than I thought. Today I received a telephone call requesting I attend a business project meeting next Thursday and the meeting is just around the corner from the UK Visa Office. There should be time after the meeting visit the visa office and confirm which of the many visa application forms I need to submit. It’s unlikely I will have received my Australian passport prior to my visit which means I’ll need to make a second trip to submit my biometric details. It will be a relatively long day for a reasonably brief meeting. There is only one direct flight from Adelaide to Canberra and that departs at 6:30am, arriving in Canberra at 8:45am (allowing for the time zone change). The is no direct return flight so I will need to return via Melbourne. This will get me back to Adelaide at 4:00pm. By my rough estimate the flying time will be approximately three times longer than the meeting. The chief financial controller is a poor flyer so it’s rather fortuitous she is the one with the UK passport. Google has been assisting me search for an internet solution to our data and international voice communications we will use on Waiouru. In a previously post I described how we have purchase a high gain external aerial to be fitted to the roof of Waiouru. This means our modem must have an external aerial socket. The MiFi looks a good option but it doesn’t have the external socket. Searching around I found this site <clicky> which provides a comparison of the various dongles. From this I have selected the Huawei E122. It has the external aerial socket and a reasonable speed (7.2 Mbps down and 2.0 Mbps up). It’s also dual band. One can be purchased from ‘3’ which from what I’ve been reading generally provides the best coverage. I don’t particularly want to plug the Huawei E122 into the laptop or the netbook as it will mean one of them will always need to be tethered to the dongle, which in turn is tethered to the aerial cable. It would be preferable that the dongle connected into a wired or wireless LAN. That way all the machines can access the network from anywhere in the boat. I’m specifically thinking of the laptop, netbook, iTouch, printer, eBook, Network Media Tank, etc). Going down the wireless trail will give greater opportunity for expanding the network. I’ve stumbled across the following device, <clicky> from Solwise. It’s a small wireless router which will accept a usb dongle. I’ve checked their website and the Huawei E122 is compatible. The website mentions it operates on 240v AC but also mentions 5-12v DC so I’ve written to them asking if the router can be powered by 12v DC. The device has a 2nd USB port and can take a webcam. I’m thinking it might be possible to link the security module on the Empirbus system to the webcam and the wireless router so the security module could waken the webcam and send a live feed via the router and usb dongle to a mobile phone. Early days and only an idea! 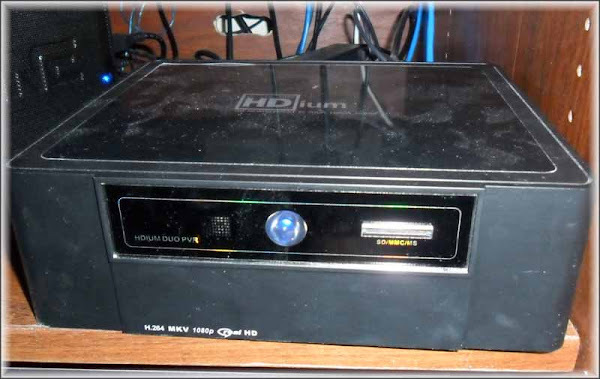 Some readers may recall my earlier posting about converting all our DVD to AVI format and storing them on the hard drive of a Network Media Tank (NMT). Doing this “crushed” them to one sixth of their original size and eliminated our requirement to carry a DVD library. We then did something similar with our CD music collection. The final piece of data was our reading material. We both enjoy reading but don’t want to fill Waiouru with loved books that may have to be discarded when room becomes a scarce resource. The solution has been eReaders. I’ve been watching them for a few years and the functionality has increased whilst the price has reduced. I actually managed to see my first eReader, a Sony, when our youngest returned from the UK with one. 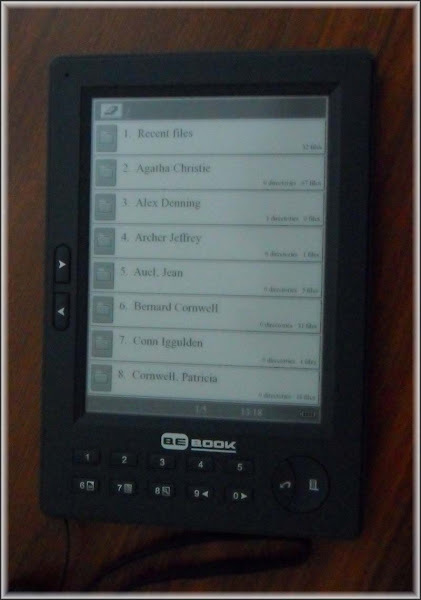 After researched a wide range of eReaders we have selected and purchased a BeBook by internet from the UK. I looked carefully at both the Sony and the Amazon Kindle. I didn’t like the latters file recognition formats which seemed too restrictive and I didn’t much like the idea of having to download by a wireless internet or mobile phone network connection. The Sony seemed to be too expensive for the functions. The BeBook was cheaper and will read a wider range of file formats. It doesn’t have a touch screen. But then we don’t need the function. It charges through the usb plug on the laptop and when fully charged it’s good for 20,000 page turns. After using it for a few months I love it. It’s particularly good on long flights as I’ve usually seen the in-flight entertainment on a previous trip. I was concerned it might get damaged so I enquired about the cost of a cover. Too damned expensive! 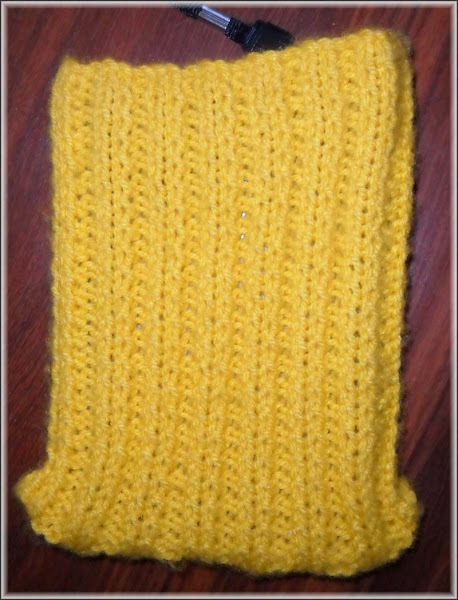 Jan has knitted it a cover. The office manager went on line and filled in the application forms for the two of us. Fortunately she can remember all the important information (birth and, marriage dates, plus locations). It didn’t seem all that painful an experience. But then it wasn’t me who did all the work. I’m no good at administration! The next stop was the local post office to make an appointment for our ‘interview’. The passport size photo’s we had previously purchased turned out to be unacceptable which meant delving into the purse (not mine) to get the credit card out for a new set of photo’s. Then I had to find someone who was willing to admit they knew us and would sign the backs of the photo’s stating it was an accurate likeness. Have you ever noticed how passport photo’s have two distinct qualities. They make you look much older and give you a slightly sinister and criminal appearance. Trevor kindly did the deed (Thanks Trevor) and we are now booked for our application interview at 12.30 tomorrow. All the required documents have been carefully compiled by the office manager so I’m confident the applications will be accepted. Once we receive our crisp new passports I’ll have to start the process of applying for a UK visa. The Office Manager, Chief Financial Officer and Chairperson of the Board already has her UK passport! I’m the foreigner! A few postings ago I wrote about setting up topographical maps in the Garmin Mapsource program so they could be transferred to our gps unit. I’d also mentioned my Google Earth canal mapping project. This is all starting to come to fruition and I’ve been able to import my first draft of canal routes and waypoints into the topographical map. This following screen dump is the same location as my previous posting on the same subject. But this time you can see the canal data. One thing I have noted is the Garmin Mapsource program requires the name of every waypoint to be unique. As a consequence it has re-numbered all the winding holes by adding a sequential decimal number to each. The same has occurred with other duplicate names. 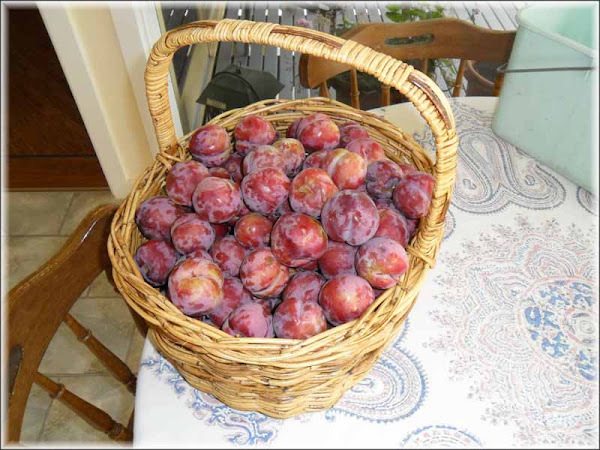 Did any readers notice what a mess I made of the Picasa Web photo linkage in the initial edition of my last post? No! Great….. then I’m not saying anything either! This is the last of our current batch of photo’s. 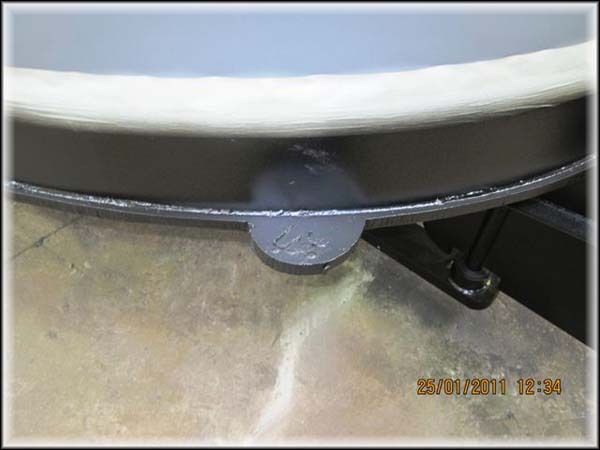 You can see the half round metal disc’s  we asked for mounted horizontally on the swim. The idea is they can be used as a step to re-board Waiouru should someone decide to step off the boat before we reach the bank :-) I believe the cylindrical anchor points  are know as “dollies”. We specified “T” type anchor points so this will need to be discussed with Ben and Kelly. It looks like we have a “lurker” hiding in the cockpit on Waiouru :-) However the top of the yellow spirit level suggests it’s one of Tim’s valiant workers standing in the engine hole frantically beavering away to complete Waiouru for her anxious, excited, and demanding owners. After a couple of very hot days the temperature dropped to 30c today which provided me with the opportunity to get out on a long walk. I mentioned in a previous post the work I’d been doing with Google Earth and how I intended to use the “bread crumble” function in the Garmin gps. This is a screen dump from Google Earth showing the route I took today when walking in the Mount Lofty Conservation Park. The route was uploaded from the gps to the Garmin Mapsource program on the pc and transferred from there into Google Earth. In the upper left corner is the edge of Adelaide city and my route is shown by the thin blue line. The line actually consists of hundreds of waypoints. I’ve set the Garmin Oregon gps to record a waypoint every 10 metres. I started at the top left corner and walked in an anti-clockwise direction. The route took me on to Mt Osmond, then “Eagle on the Hill” to Crafers (bottom right) before heading up to the high point at Mt Lofty summit. I then made my way back to the start point covering approximately 20km at an average speed of 6km/h. This is the view from Mt Osmond looking west towards the centre of Adelaide city. This next photo is from the Mt Lofty summit. Again looking west towards the city and gulf. Both scenic photo’s were taken using the camera in the gps. The gps has a function that enables the user to link a photo to a waypoint. I need to learn this function as it may prove useful on the canal. Well, two days ago I configured Google Analytics to work with the blog and despite the program telling me I’d see statistics within 24 hours it didn’t happen. Eventually worked out why…….. I’d failed to configure it correctly. A simple oversight on my part which was easily rectified. Today I looked at my first report. To my surprise I discovered other canal boaters had found my blog and had already placed my blog address on their blog list. After three months of quiet blogging we’ve been “outed”! Back to Google Analytics. Of the 32 'visitors 26 are unique. I guess that means once during the 24 hours. Actually, I might be wrong. It’s once during the previous month. But then the clock has only been running 24 hours! 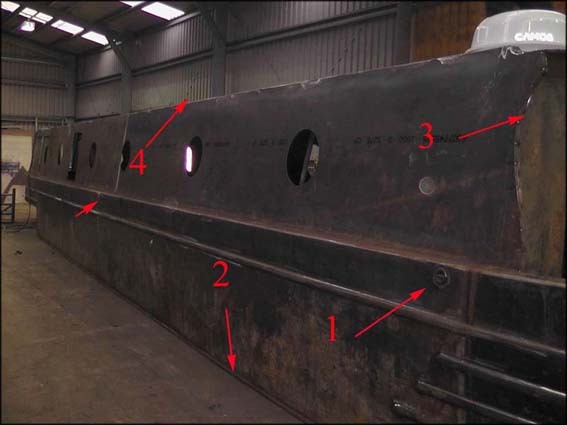 Three have come via our boat builders website (Ben Harp Narrowboats). Three from other bloggers sites and three from Sue of “No Problems” website.